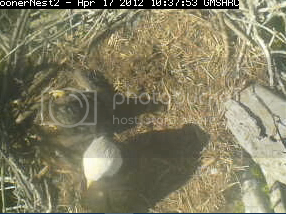 Both parents in nest! 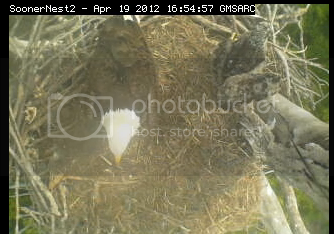 Eggbert's pins are starting to show. 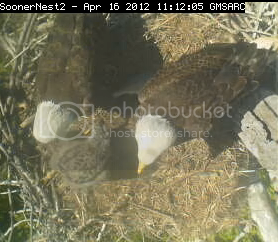 I think it's clear in this picture that Mom is on the right! Actually from the time stamps on those pix, this may be two or three separate meals. 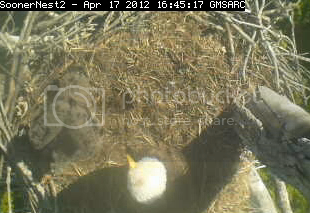 Eggbert is certainly not starving! Weather in Oklahoma is warming up. 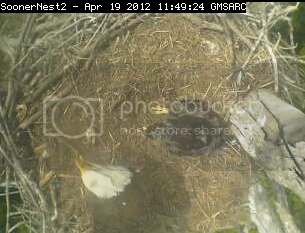 A lot of wing spreading during naps. Look Dad, I'm starting to look more like you - same shape - I've even got a tail starting - and my feathers have really changed color! Starting to survey my realm. 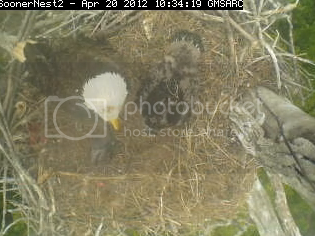 A busy day on all the nests: rainy at Dec; Vian teens dropped in for a visit; Eggbert with his Dad. Looking almost as massive as Dad! He really wants to know what's out there! And after all that activity, time for another nap! 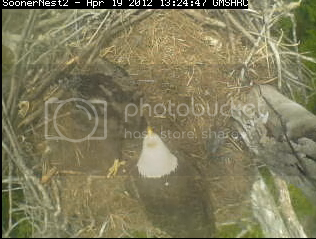 Both parents in the nest. Eggbert's really growing a tail! And of course he loves showing us his shapely ankle/calf/leg - NO! talon! But here's the beginning of a new season. 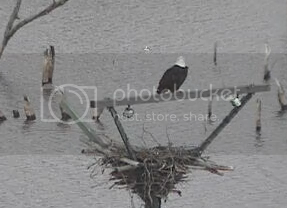 The Sooner parents have been dropping in and out of the tree nest and Sutton has installed a new and very sharp cam at the lake nest. 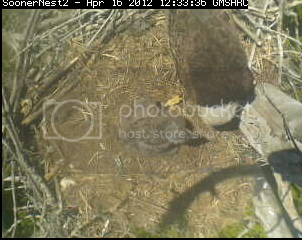 Regular observers say that the hole in the tree nest (through which young lets have fallen in the past) appears to be blocked at last. 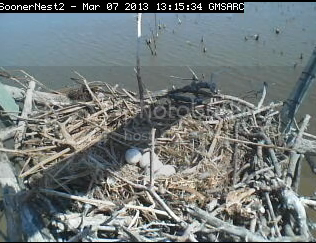 And the lake nest looks better than it did last season. No way to know which one they will choose. 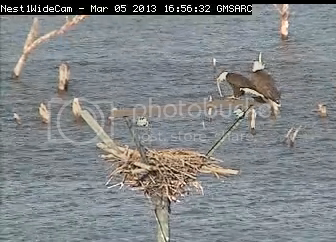 Here Mom (or maybe it's Dad) looks lazily over a shoulder at a duck swimming below - Dinner? Do I have the energy?" Amazing news this morning! It's Christmas in Oklahoma. 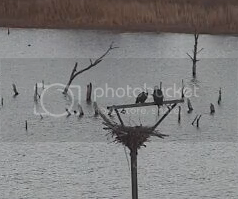 Sutton has brought the two Sooner Lake cams back on line and when I refreshed and saw them this morning, Ethel was sitting in her nest! 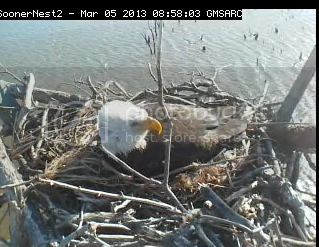 And then one of the chatters told me she has one egg! No one knows (unless Sutton does and they are holding out on us!) when the egg was laid. But my trusty Post-it says that in 2011 this pair laid at the end of February, first week of March. 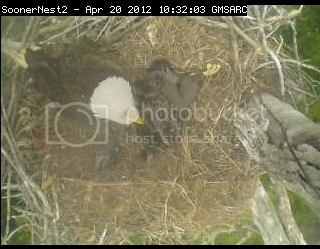 Perhaps we will get to see a second egg being laid. In 2009 and 2010 they laid earlier. And in 2012 they laid considerably later. Now I am in total shock. 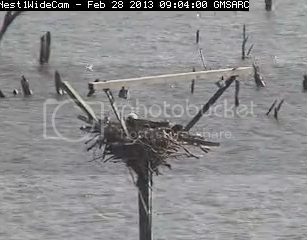 Sutton just posted on their page below the cam. 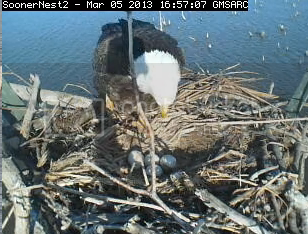 28 February 2013: Good news from Sooner Lake! 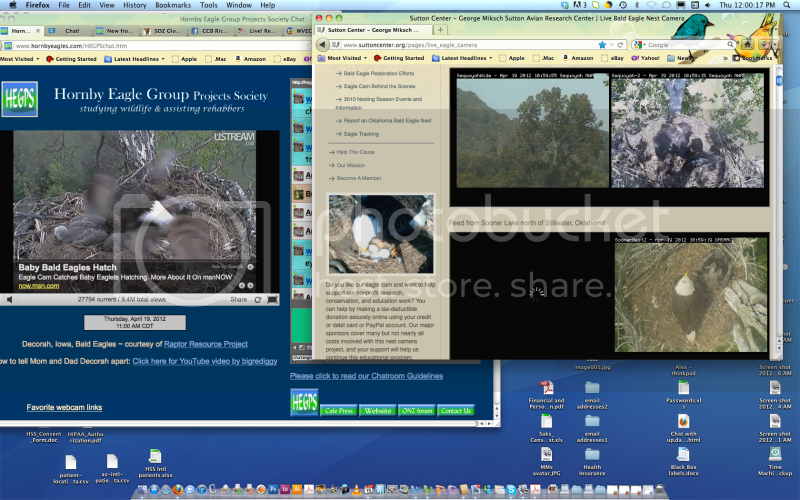 After the nest tree fell down (see the December 21 report, below), the eagles were visiting a couple of alternative nest sites, and ultimately went back to their original pole nest. 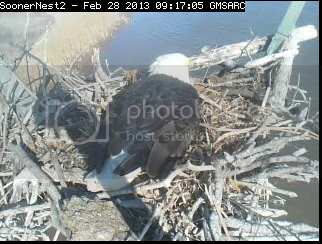 We were able to replace some broken equipment yesterday, and are very fortunate that the aging cameras mounted on the pole above the nest are still working so we are able to have the close-up views into the nest. 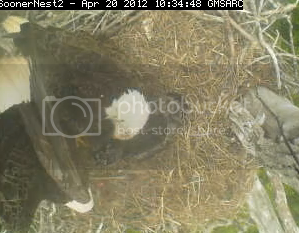 For longtime viewers of our nest camera project, having the eagles nesting here again is just like old times. 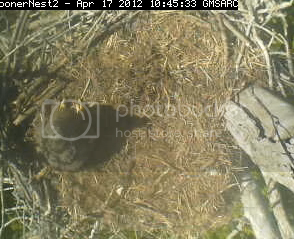 To top it off, this nest has a very unusual 4-egg clutch! Look at that last sentence! When have we ever seen that before? Wow, Maggies! 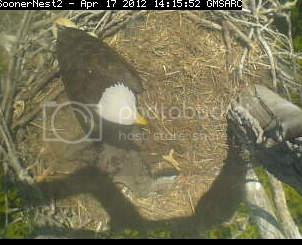 a 4-egg clutch - that is rare for sure. 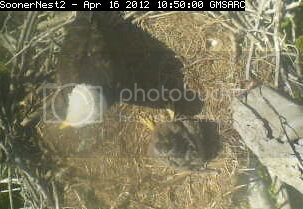 I am not sure how many 4 egg clutches have been recorded, but raising four to fledge is daunting. 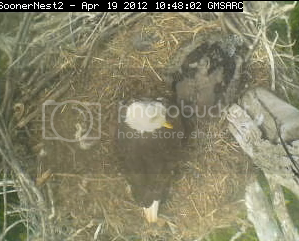 One such nest was recorded in Virginia in 2011 (blog post HERE). In that blog post, the writer says: As far as we are aware, this represents only the third 4-chick brood ever documented for this species. 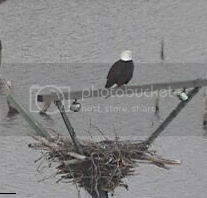 The first was in 1986 on the Eastern Shore of Maryland and the second was in 2009 in the water gap portion of the Delaware River. Nancy - I just saw this post in the Sutton chat. 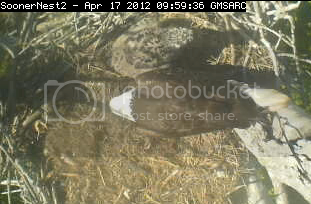 It seems the Sooner Lake pair had 4 eggs in 2008 - but only two fledged. 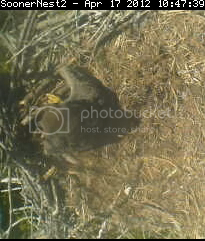 There were four eggs laid in 2008, but the cam was down for a month shortly after they started to hatch, so we don't know how many of them hatched; there were two eaglets when the cam came back, and both fledged successfully. thanks, Maggies - you know, when I read your post, it seemed familiar ... so this pair has a history for 4. I hope this season will be kind to them. Sutton went and changed out parts and made repairs to the two cams today. 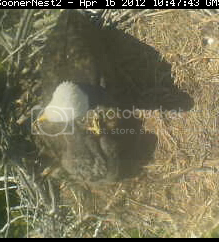 I missed it but several of the chatters saw Mom get up and roll the eggs - all 4 of them - shortly after the cams started working again. It's a beautiful day in Oklahoma and the lake is sparkling! 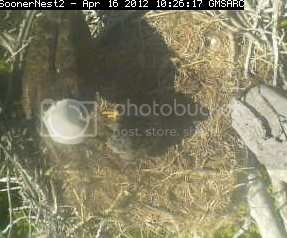 Cam has been on and off today but chatters have seen the 4 eggs once or twice. 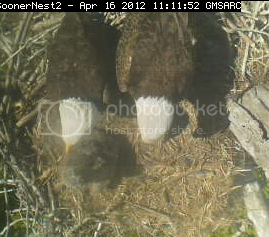 Mom gave us her profile this morning instead of the back of her head like yesterday. 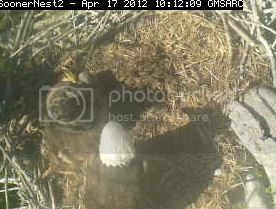 Yesterday was a beautiful afternoon at Sooner - and I saw the eggs! 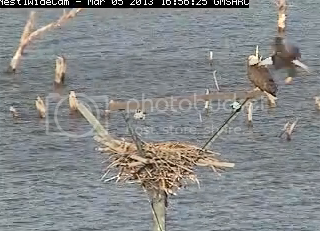 and both parents sitting on the cross bar! There was a little talking going on in the last scap. Thursday (yesterday) was another nice day at Sooner. 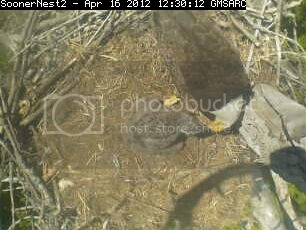 Dad was on the nest for a good long while. At least I assume it was Dad because of the egg arrangement when he finally decided he had enough. 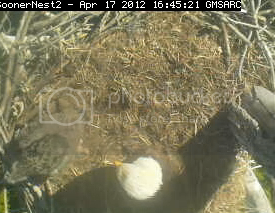 the eggs were uncovered for almost a half an hour before someone came back to keep them covered.